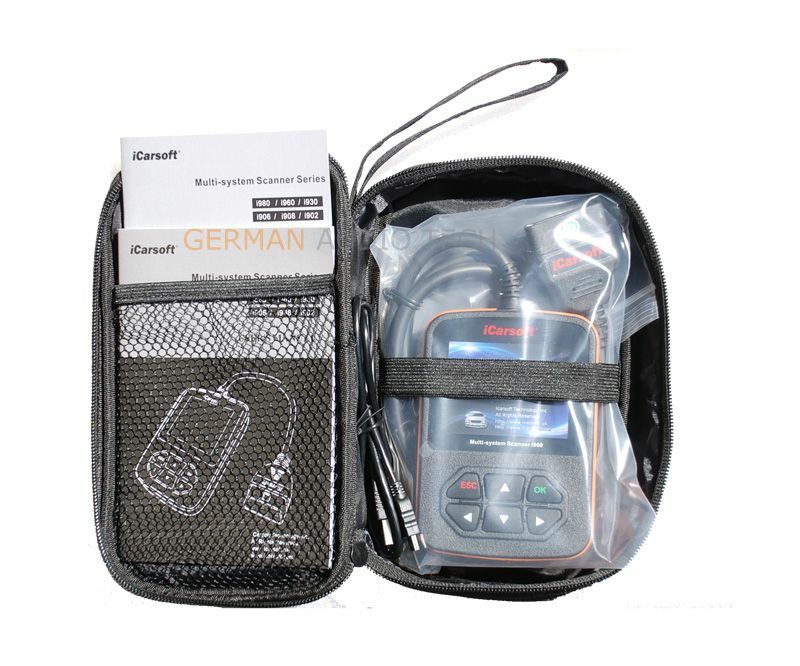 This is your opportunity to purchase (1) Brand New iCarsoft i903 OBD2 System Diagnostic, Code Reader and Reset Tool. Will work on 1997-2015 OBDII INFINITI, NISSAN and SUBARU vehicles (see list below). Comes with an unbeatable manufacturer 1-Year Quality Warranty. This is a must-have device for all your code scanner, diagnostic and fault reset needs!! With its great presentation and quality of design, it would also make a great gift. Device is Easy to use and Simply plugs into your vehicle's OBDII diagnostic port. Comes brand new with: Original Packaging, Storage Bag, Adapter Cable to your computer, and Printed Instructions Guide. With this professional grade tool you can save that dreaded trip to your dealership, just to be charged a $100/hour+ 'diagnostic service fee'. Know what is wrong with your car prior to a visit to your mechanic, and possibly fix the problem easily yourself. This durable tool comes with 24 hour international product support and online updatability. If you have a question please contact our customer support before purchasing and/or iCarsoft directly. All International Buyers Welcome. PLEASE NOTE: If you are trying to determine if this tool will perform a specific task for your specific year and model vehicle, please CLICK HERE for PDF Guide. Please Do Your Research before buying! Avoid returns because the tool does not perform a specific task you were hoping for by knowing what you are buying. This iCarsoft product is not sold by, endorsed, manufactured or implied to be a Nissan product. We have to disclose this because Nissan Motor Corp. trolls eBay removing listings claiming 'unauthorized use of intellectual property rights' which sellers in no way violate. The iCarsoft i903 is a diagnostic scanner and tester which has been designed specifically for Nissan, Infiniti and Subaru vehicles world-wide. It will allow you to read and clear diagnostic faults from main systems in real-time within your vehicle such as SRS airbags, ABS Antilock Brakes, engine, transmission, and body modules. We have spent years testing the scanner on many vehicles with excellent results. Compared to higher priced kits on the market that do exactly the same as this kit, we feel it offers excellent value for its cost. The i903 is an easy to use, stand alone unit that will have you scanning your vehicle within minutes. Simply, plug it into the OBD II port and the device will boot up with step-by-step instructions. This scanner has a large, easy to read 2.8 inch color display accompanied by a user friendly interface and requires no additional software. We will even upgrade the software to the latest version before shipment. As an added bonus, the scanner is equipped with full OBD II software capabilities that will allow you to scan and clear the check engine light on any make/model vehicle 1996 and newer.